For the second round of the tournament I’d get to play against one of my favorite opponents in the French/Belgian scene, none other than @Tartignolle, the organizer of the Myreille Strategic Tournaments that I have enjoyed attending over the couple past years! Tanguy is a very good player, and most of all a very great guy to play against! What was a bit more disconcerting was his ability to write very effective army lists that go against any kind of trend and surprise his adversaries! He had brought the “weak” Ogre Khans, and a list that would prove to be a nightmare toface! So lets see: 99 Bow Shots, 2 (6x6) Catapults, 2 Cannons, Pyromancy magic, and six anti-push models that are immune to stomps! I was very worried about this matchup, especially since the scenario we’d be playing was Capture the flags. 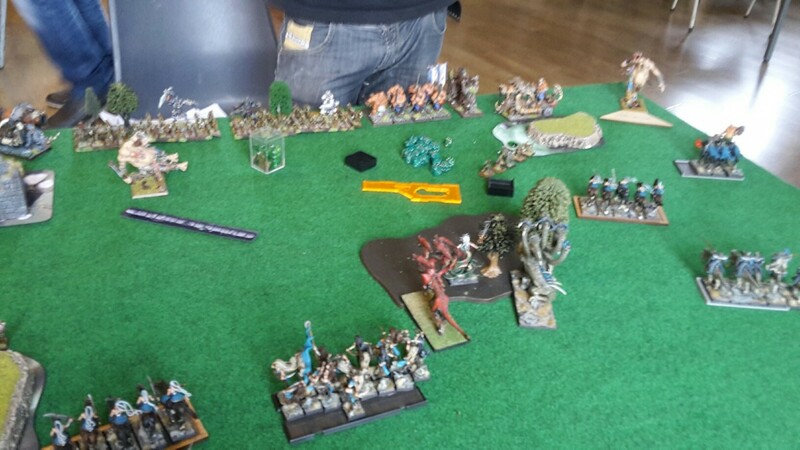 My opponent went for Flaming Swords, Burning Embers, Pyroclastic Flow and Cascading Fire for his spells, whereas the Acolytes got Grave Calls/Breath of Corruption and Crippling Fatigue/Altered Sight. Thankfully, he won the roll for picking sides, which gave me the opportunity to deploy my entire army for the first turn! That meant that I’d be getting one less turn of cannon fire and the opportunity to put some cover between my monsters and the cannons! I deployed wide, keeping the Krakens and Dragon relatively central and my infantry units packed, so as to avoid the giants rushing in to kill them. The ogres responded by hugging the long table edge, with a cannon and a Scratapult on each flank and the giants evenly spaced , two on the flanks and one right in the middle. The trappers put all sorts of traps into the various terrain pieces, and the hunter scouted up my right flank, right where my scoring Dread Knights were. With limited options available, I pushed forward: both krakens moved into the forest, followed by a medusa. The Dragon relocated to the left flank, putting the hill and the impassable terrain between itself and the cannons. The dark raiders on the left moved up aggressively, tempting the Scratapult to charge them, so as to pull the beast closer to my Dragon. The infantry stayed 24” away from the bows, not eager to get a first turn volley without incurring any penalties.Finally, to the right the dark raiders moved up to pin down the hunter, with the Yema acolytes and Dread Knights in close support. In the magic phase I got the “1” card, and powered through a boosted Grave Calls on the hunter: unfortunately, only one wound was suffered by the ogre character! 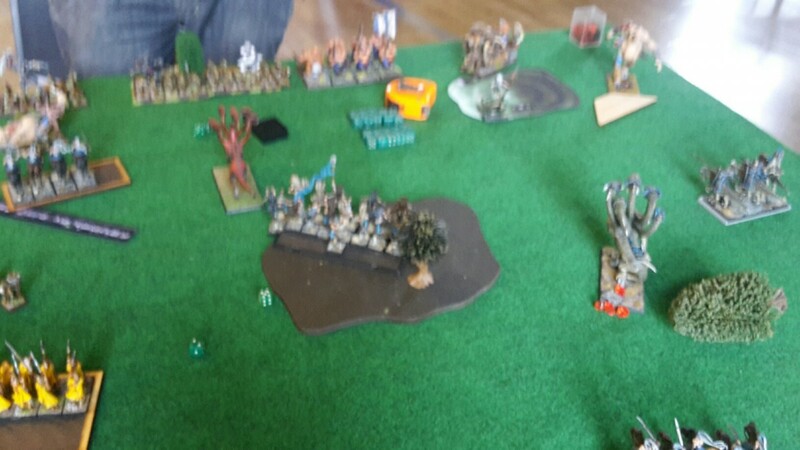 The ogres took the dark raider baits: the ones opposite the hunter stood and took it, while the left ones fled from the Scratapult towards my lines, hoping to pull it out of position. The giant to my right caused a terror check on the yema acolytes, who failed and fled, leaving the Dread Knights somewhat isolated. 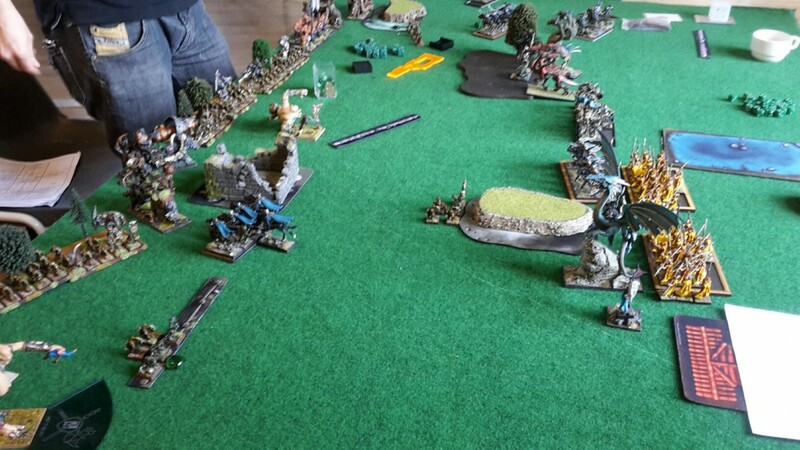 On the left, the scrapling trappers pushed the dark raiders further back, through my lines, and the scratapult failed the charge, moving a disappointing 2”. The rest ofthe ogre army maneuvered a bit, not really hard pressed to engage my units. The scrapling trappers moved up the hill and inside the forest, putting traps on both terrain pieces. Magic sawthe Shaman try to fry the kraken with a pyroclastic flow, but it failed to do any damage: I then dispelled burning embers on the dancers of Yema. Shooting went better for the ogres: the right cannon took aim at the rightmost krakenand scored a hit, causing four wounds! A scratapult managed an indirect hit onthe mddle spearelves, killing five of them. Finally, the second cannon, that had moved past the impassable terrain towards the left, failed its shot against the dragon. In combat the Hunter dealt with the Dark Raiders with ease, but not before suffering a wound from the riders’ attacks. With a Kraken already half-dead and a couple of units fleeing, I knew I had to push forward as fast as possible: the Dread Knights charged the victorious Hunter,the Dragon declared a long charge against the Scratapult and both medusas charged the scrapling trappers near them: the ones in the forest fled but didn’t go far enough, allowing the medusa to catch them and reform on top of the hill, with very good views of the cannon, the Shaman’s unit and the nearest Scraplings. The dragon failed its 11+ charge on the scratapult, and moved 5” forward. The medusa breaking through to the right was all the signal the rest of the army needed: The left acolytes moved up to block the middle giant, allowing the Dancers of Yema and the unscathed Kraken to move forward towards the soft underbelly of the OK army. Both the Raiders and the Acolytes rallied, and the two legionnaire units moved up as well. In magic I only managed to get the Altered Sight hex off on the left cannon, but combat went better, with the Dread Knights killing the Hunter for a single casualty back.The medusa only killed a single trapper to the left, and they fled to safety towards the middle of the table. The ogres went on the counter-attack: the rightmost Giant charged the victorious Dread Knights, who fled to safety, then redirected into the half-dead kraken but failed to get in. The middle giant went for the blocking Acolytes and they held their ground. The fleeing trappers rallied, and both kin-eaters appeared: one right next to my fleeing Dread Knights, and another on the right part of the Ogres’ backfield. The medusa on the hill was proving to be very annoying, since it could menace both the cannon and the Shaman’s unit. 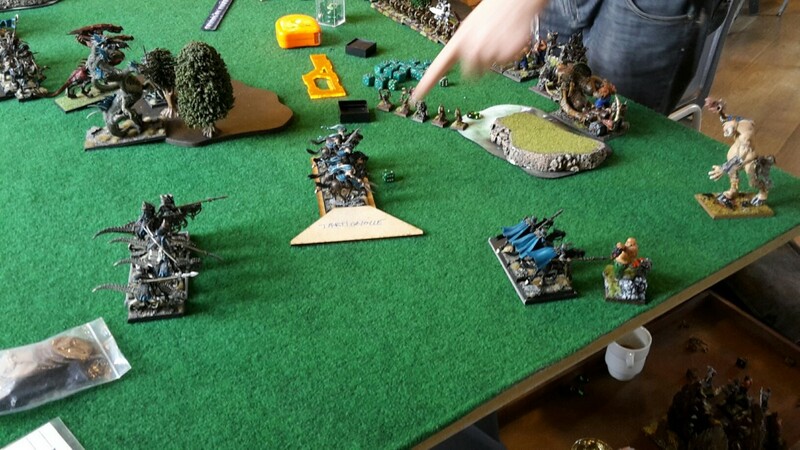 After a lot of thought, my opponent decided to take the general out of the unit, move the Thundercannon out of Line of Sight and blast the medusa in the magic phase. The giant to the left maneuvered to threaten my dragon’s flank, and the shooting battery remained static. In the magic phase things looked up for the Dread Elves: a combination of a smallphase (card 1), bad casting rolls and horrible to-wound rolls for the spell that went through meant that the Medusa on the hill survived the magic unscathed! This was compensated in the shooting phase: the left Thundercannon took aim, hit and wounded my Dragon and managed to deal maximum damage! Now the beast was clinging to its last wound, but thankfully the scrapling bows failed to cause it. The right thunder cannon misfired and lost the ability to shoot for the entire game. The remaining scratapult got a direct hit on the left spears and which resulted in 11 wounds! Finally, the scraplings to the right tried to wound the nearest kraken but failed, and their mates in the middle put two wounds into the leftmost medusa. 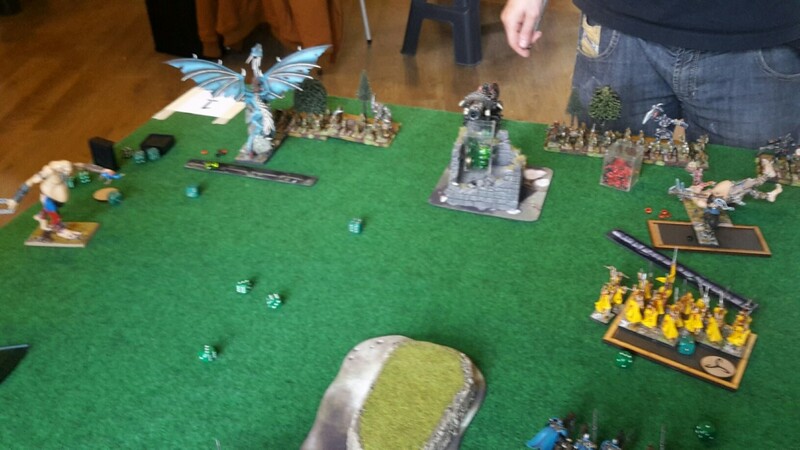 In combat the Giant took three wounds from the Acolytes, and managed to sneak two wounds past their Aegis save. The combat was tied, leaving the lone unit champion to deal with a very angry giant! Two turns of ogre fire, and now I had two crippled monsters! Knowing that I wouldn’t be able to survive the shooting for much longer, I declared charges: The dragon charged into the scratapult, with a clear overrun path into the scraplings and out of the giant’s Line of Sight. The left medusa charged into the Giant/Acolyte combat: with four wounds remaining on the giant, I figured that the extra S5 attacks would help bring him down! The middle spearelves charged the recently rallied scraplings and killed them in the subsequent combat, while the kraken to the right failed a charge against the right giant. Finally, the Dancers/Kraken and Medusa to the right went for a combo charge; the Kraken and Dancers charged the Tribesmen, while the medusa charged the shaman, aligning itself so that in the base case scenario the Kraken would manage to overrun into the second combat. Things went great and I got the 8+ charge roll needed for the Dancers to make it in combat, meaning that my Kraken would get to fight twice this turn! The Dread Knights rallied, but were at a very precarious spot right next to the kin-eater. So I moved the Yema Acolytes in a position where they’d allow the Dread Knights to flee through them and to safety, they’d probably be able to deal with the kineater thanks to their poisoned attacks and aegis. In the magic phase I tried to cast Crippling Fatigue on the middle giant, but it was dispelled. This allowed me to cast the Deceptive Glamour bound spell twice on the Tribesmen, making them DS1: the game depended on my elves breaking this unit, so that +1 to hit could prove to be important. In the ensuing combat the Dancers and Kraken managed to deal enough damage to auto-break the Tribesmen, which permitted an overrun of the Kraken into the shaman fighting the medusa. 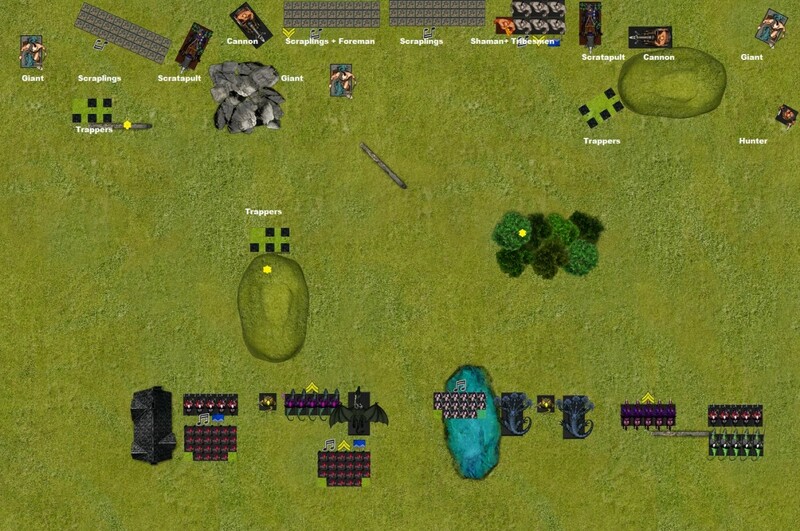 This resulted in a dead Ogre general, and all of my units overrunning out of the board and to relative safety. The Dragon and Prince managed to deal enough damage to kill the Scratapult outright (I had to use the Breath Weapon, so as to ensure that the beast didn’t manage a lucky wound on the dragon! ), and overran into the scraplings behind. All of the scrapling units proved to be very brave and passed their panic tests this turn. Finally, the giant in the middle warded off the attacks of the medusa, took a single wound from the acolyte and proceeded to kill the medusa and leave the acolyte on a single wound. Thankfully, the latter passed his break test and stayed in combat for another turn! The previous turn had been a disaster for the ogres, who were now down a scoring unit and the General. So my adversary went scoring-unit hunting: the left giant charged the leftmost spearelves, who fled to safety. The Kin Eater on my right flank charged the recently rallied Dread Knights, they fled but fell short of the 6” mark to pass through the Yema Acolytes: this meant that the kineater caught them in pursuit! Finally, the right giant charged into the Kraken once more, but the prospect of receiving S5 impact hits before it could strike led me to flee that charge. The beast fled a massive 12”, and would rally on Discipline 4 on the following turn! In movement both Cannons maneuvered into charging positions for the following turn, as did the kineater up top. With magic and scratapults both gone, the only thing left was for the two units of scraplings to try and whittle down my middle spearmen: they did a great job,killing five of them and panicking the rest! 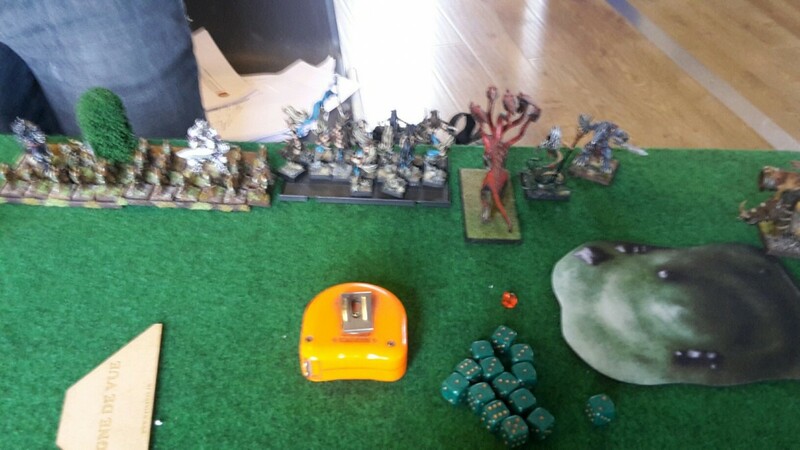 In combat the Dragon stomped scraplings left and right, but they refused to flee, passing a Break test on 5 rerollable. The Giant took another wound from the acolyte champion but then he finished off the unit. With a good part of my army fleeing and the rest severely weakened, I had no charges to declare: all of the fleeing units rallied, even the Kraken on a roll of 4! 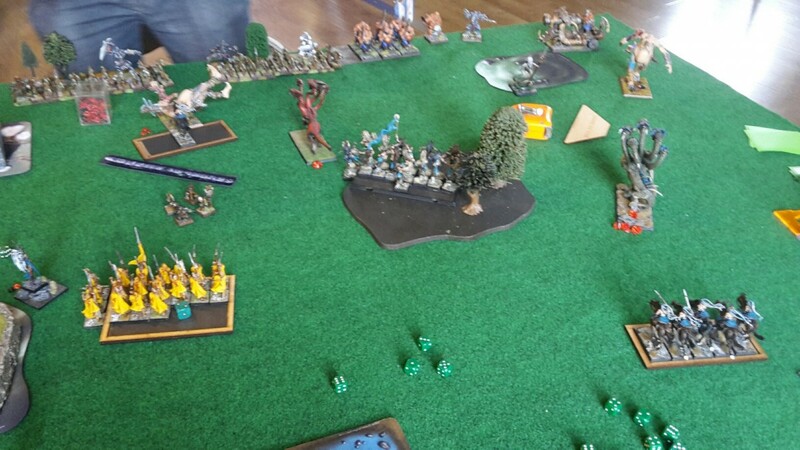 The Dancers, medusa and Kraken all returned into the table, and maneuvered in such a way so as to limit the charges available to my opponent on the following turn, while threatening the flank of the scoring scrapling units. The Dark Riders jumped in front of the left giant, so as to stop him from charging the Legionnaires again. Finally, the Yema acolytes moved away from the kin eater and towards the middle giant. In magic, Imanaged to power through a Grave Calls on said wounded giant, causing the two wounds necessary to kill him. The ensuing panic tests were failed, and both scrapling units in the middle fled off the table, giving me a huge advantage scenario-wise. In combat the dragon once more did well, only leaving 9 scraplings alive: they passed another shaky Break test on a 5, dooming my general! The left Thunder Cannon charged into the Dragon’s flank and the left giant charged the Dark Raiders blocking him. 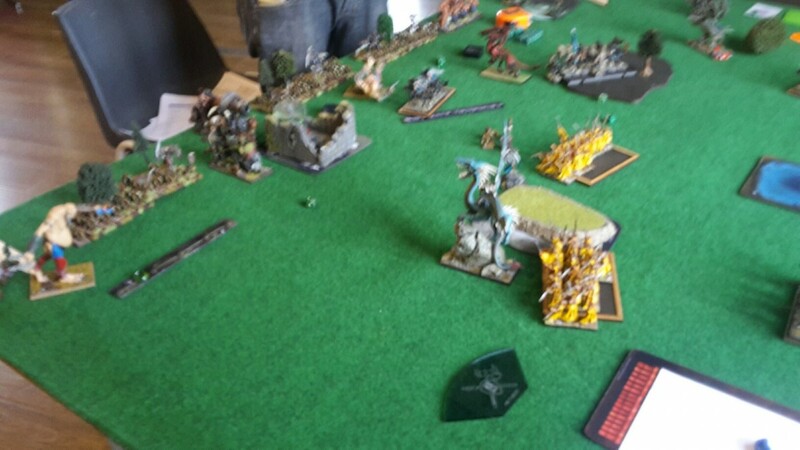 TO the right the thunder cannon failed a long charge against the Kraken. 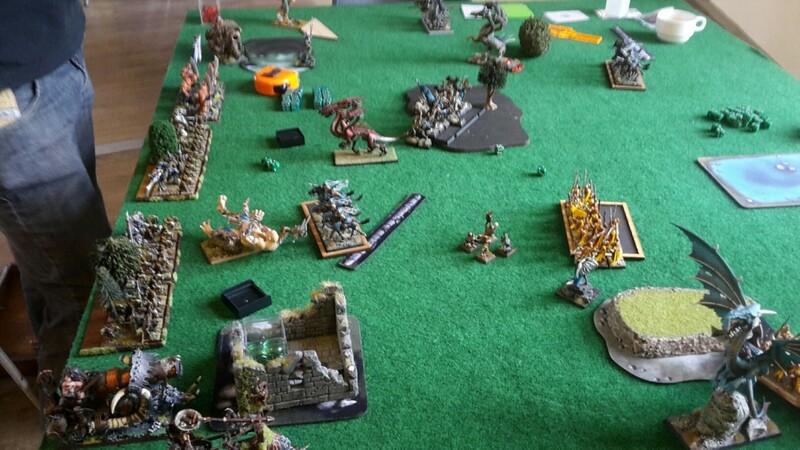 The rest of the Ogre units maneuvered so as to try and box in the dread elf forces. In combat the Impact hits alone were enough to deal the final wound to my general, while the Giant dealt four wounds on the Dark Raiders and sent the last survivor fleeing. The rest of the game was pretty much cat-and-mouse: I tried and managed to keep all of my scoring units safe, fleeing where necessary. I couldn’t deal any more damage,and on my opponent’s closing turn he tried a couple of very long charges that would potentially allow him to catch a unit of Legionnaires and/or the Dancers of yema. All of the charges failed, leading the game to a close. We counted points, and ended up with around 2800 points each, for the closest of draws. However, I had managed to kill 3 of my opponent’s scoring units as opposed to a single unit for him, meaning that I won the secondary objective! 13-7 Dread Elf victory! What a close game! Tanguy was a great opponent, taking the good luck and the bad with the same smile and a sense of humor, and he played a very tight game. His ogre list is surprisingly effective, and there doesn’t seem to be any bad or unnecessary choice in it. Going into the game, I was expecting to lose due to the amount of shooting and magic that would be coming my way. What gave me a fighting chance was getting the first turn, as well as a couple of underwhelming magic phases for my opponent. In contrast, I got the crucial rolls that I needed to rush the gunline, and this allowed for some breathing space. If I had to do this again, I’d approach the game in the same manner more or less. Hiding monsters from cannon fire often feels like delaying the inevitable to me, especially when the goal is to limit the amount of shooting coming your way in the long run. Forcing the enemy to split his shooting resources (the case of dragon behind the hill) means that inevitably something will fail and you’ll be upon the enemy battle line in a couple of turns. However, removing handfuls of models per turn while you’re not even putting a scratch on the opposing army can be a stressful experience. If I may ask to the pointy ears General.. When overrunning into a unit it counts as a new charge: you are allowed to perform a single wheel up to 90 degrees, and can align in any legal position that this wheel takes you to, as long as you are maximizing. The reason I did this move was to move past the Giant's line of sight, avoiding thus a flank charge. Lovely report! Quite an unusual ogre list. That was a bloody game hahahha! Great read !